Any other Plumeria fanatics out there? I love plumeria! I tried to grow a cutting once, but it died. It was such a tragedy. Regarding rooting Plumeria, it's pretty easy if you try it during their dormant season, fall/winter. They seem to rot easily and not root at other times of the year. 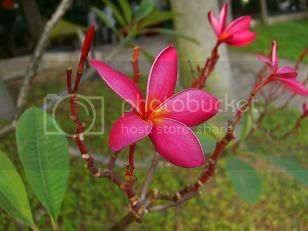 To grow Plumeria cuttings best to take a cutting in early spring as the weather is warming up and then stick it in a platic tray without soil and let it dry for about two weeks. When the base has dried put it into a 6 or 8 inch pot with growing media depending on how tall a cutting it is. They do graft them too now! I planted one at my mums house that was cut off at the base and left to dry out for three weeks then stuck in the ground and away it went. It was 8ft tall ! It was 8ft tall ! I have one only. I love them but the climate here isn't ideal even though they do grow and flower. Mine is just starting to form leaves as we are in summer and it's quite warm now........hopefully in a couple of months I can post some flower pictures. Thanks for the link. Neat-O. This frangi is in my front yard. I took these one morning when they were just starting to bloom. Beautiful flowers, aren't they? My smell pretty, too! When I lived in Hawaii, the plumeria grew all over, including the parking lot at the grocery store! They seem to grow like weeds in tropical areas. I love them and they have a wonderful scent. I wouldn't attempt one in my climate as they obviously need a lot of humidity, but they sure are beautiful. I lost one (Red) last year to some scaly parasites. One (white)is OK but has lost its leaves.And i am sure it will be Okay this summer. I have planted three more recently but so far no sign of any growth. It is hard to come by them here in Toronto. I had some flowers last summer. Not many though. 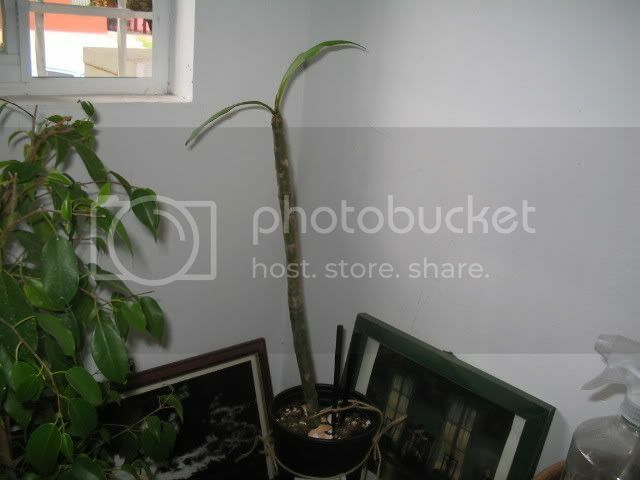 I attach some photos of my white Plumeria (past summer) which dropped all the leaves during this winter. I hope it will grow back. It will, Pikevi. Most of you would probably be totally aghast at the care, lack of, my Frangi receives. There are times during the summer because of lack of water, all the leaves will fall off and start again. The Frangi is a very tolerant plant, tree, where I am. We have been in a drought in FL, but, as the pictures I have attached here show, the Frangi continues on. We don't irrigate. I took these this morning. In fact, when Hurricaines Florence and Jeanne blew through, this tree was completely uprooted and blown to another place in the yard. My hubby just picked it up and stuffed it back in the ground, twice! I'm not trying to brag about the lack of care my plants receive, in fact that is why I joined this forum! Trust me, I care much more for my orchids and violets, I have three of each now. I just wanted you to have confidence your plant will come back. This winter when we were threathened with frost here in the Galveston area, I pulled mine right out of the ground and put them on my enclosed porch. (bare root) Come March I put them back in the sane spot and they are leafed out and ready to give me inflos soon I hope.They are really easy to take care of. I have 2 stalks rooting now, and some seeds I got for free to try my luck with this weekend. I hope it does too. Gladys47: how do you root the stalks?. I think one of the three I have planted in pots is getting soft. I hope I am not going to lose it. It is actually called a Franjipani not FrangiPoni, or here in Oz we call them Franipannis (nick name). You just plant a cutting here and off they go, no problems same as Hybiscus. I only had 1 Phal flower and 3 others re-flower in the past 8 months or so. I either plant in sand or cactus mix. Water once when planted. Put in a warm spot and do not water again until it leafs out. sometimes it can take awhile.If too long you can give a small sip of water, but I don't. You can mist the bare stalk occasionally. Be sure to dry out the end of stalk before planting to decrease chance of rot.It stores water in the stalk so it will be ok without water for some time. warmth seems to be most important, next to dryness. You can sit out on cement during the day, just be syre to bring in or shelter if it rains. Works for me, but others may have better advice. P.S I would only give small sips if the stalk started shriveling, then only a little. Of course keep an eye out fot rot. I did not realise that it warrants such a unique care. I have been keeping them wet from the day I planted the three stumps. One is already 'soft'( it pits on pressure just above the soil level). I would not water the other two from now on. I am planning to uproot the soft one and cutting off the part that is soft and re-planting it. That one is gone. It was mushy right up to the top. I don't know which one I lost- red, yellow or red. I heard that yellow ones are more scented. For better chances of survival you can purchase some cutting gel that'll seal the cut a little better to ward off infections/rot. Hey I just got back from Fiji two days ago and Frangipani was everywhere, I will post some photo's of some rather large trees when I figure out how to do so in this forum. I have one small plant in my backyard but it doesn't do so well lately........no flowers for the last two years but when I owned my glasshouse it flowered all the time. They are wonderful plants and I love the aroma they produce. That sometimes happens,even when you do everything just right.I saw some cuttings at walmart yesterday ,with the baby orchids in the little plastic bag.From Sun Bulb I think. Don't give up! Try again.I have heard of people water rooting them but have never tried it myself. I hope it has a nice fragrance too!! Gladys47: As you suggested the 'bald' Plumeria has put out some leaves. I have been leaving the plant outdoors each day( nights are still very cold here) for the pastt week. The leaves seem to be small but quite green and healthy. Where can I get one of these Plumeria plants they are kinda nice? It is very hard to come by, flowerchild. I got this one ( white) from a place in scarborough- Valleyview gardens just north of Finch on Kennedy last year . It was a very short stump without any leaves. But It grew very well in a pot last summer. They have another one , just under 2 meters (about 6 ft.) high which they don't want to part with. The flowers are scented and give off a a very pleasant fragrance. I've just reviewed this thread again with interest. Mine is going on its third year and is just now coming out with leaves again. It looks like everyone that gets these to bloom lives in Florida or some other southern-like climate? Am really curious if I might expect any flowers up here in rainy Oregon? So nonavailability= high price, guess I won't kill myself looking for one eh? Mayres, they like sun, sun, sun. Mine is in the front yard, no shade. The rains have just begun, so, my Frangi has just begun to flower. In fact, it is looking happy today. Attached are pictures from this morning. If you look back in this thread, you will see the same tree earlier with no water for a while. Very hardy tree. Moving the pots in and out to accomodate the seasons is hard work. I have a few huge plants (Bananas, Bougainvilleas, and Oranges) that are a real pain to move them back and forth. Plumeria has latex and most latex plants are very hardy and can survive drought. In addition they can drop the leaves to conserve water. flowerchild: If I remember correctly I only paid our $19.99 for the potted stump of about 25cm or so and $10 eaach for the stumps at the show. If it flowers it is worth every penny , I suppose. Gladys47: please let us know how 'water rooting' goes. I can only try it next year unless I find a place that sells the stumps. Last edited by pikevi; 05-22-2007 at 08:45 AM. Chefatplay - I agree with pikevi, looks like you are living in the garden of eden there? Wow! PiKevi, they do drop their leaves very easily, too. Sticky mess when you are the cause of it. Mayres, FL is good. I came to visit my room mate from college July of 1976, I moved here for good that October. I was 19. I turned 50 this past October. 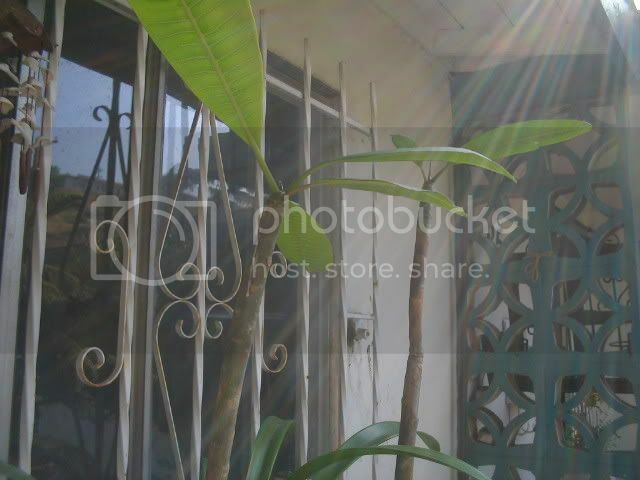 I have Washingtonians, Queen Palms, Oak trees, Maple trees, Thatch palms and banana plants. Also, red ants, lizards, bugs galore, snakes, my Jack Russell takes care of them though. I also have three Avocado trees in buckets still. We have these because they survive on their own. Also, my husband can grow anything. I am trying to catch up with him! I am actively looking for different coloured ones. Thanks Pikevi, I can always count on you!!! my Frangi has just begun to flower. Gosh! I don't have blooms yet. I'm jealous! Of course, like I said up several posts ago, I had to yank mine out of the ground and store bareroot this winter. Never done that before but always heard it would slow down their start. Lots of leaves tho so inflos are coming soon. (fingers crossed) The reason I posted tho is I started the water root today. Will keep you posted. I am going to start one in straight perlite tomorrow and try that too! So far my other 2 look well. They are in cactus soil and perlite mix. Also I am going to use a cut off clear plastic water bottle so I can see whats going on in there! I get all antsy waiting.I want to know as soon as I have roots. I have NO patience! They'll come around Gladys. They're hardy lil critters... They'll make it. LCA, mine are white with yellow center. How about yours? Very similar to yours but with pink edges on the outside... Your leaves look more rounded like a Celadine. That picture I posted was a AztecGold with the distinct peachy smell... I've got quite a few others that aren't bloomin' just yet... My favorites that I have are tri-colored. They really look sharp. I have two Plumerias. I live in San Diego so I put them outside in the beginning of may since it starting to heat up. But I hate may and june since we get so much marine layer and its so gray. Hopefully my plumies will flower next spring or summer. They have leafs and I am not sure what color the flowers are going to be. Sea Sun, nice green stalk and green leaves and it looks like a new leaf growing. Good going. Do you know what color the flower is? The flowers are going to be pink. Cant wait for it to flower. Are those cymbidiums next to the Plumie? Yes, they are, Sea Sun88. They are out in a temp. GH now. I guess I was lucky mine took root. I was watering them everyday. Good thing it was dry around here for awhile. I did dry them for about 3 weeks. Then just stuck the branches in the ground and now they all have leaves and one is flowering. They look better in my garden at the back since they drop all their leaves once it gets a little cold in what Floridians call 'winter'. I have one that looks like that and I was always wondering what kind of orchid it is. Sea Sun88: I got those without any tags and dried up and out of the pots. Someone said it will be easier to identify them once they flower. Nice healthy leaves. My two plumerias are also starting to leaf out. I know for sure that one has pink flowers but the other didnt came with a tag. I think pink ones are the most fragrant of all plumerias. I bought three stumps a few months ago (pink,red and yellow) and one has since died. Two seem to be OK,hard and green. I am not sure which two colours survived. Which ever color they are, I am sure they will smell pretty good. I am new to plumerias as well as orchids. I like flowers alot so any plant with flowers will do for me. I wonder how big the cuttings can get? My cuttings arent really that big, I am guessing 2 feet. But good luck on your cuttings. SeaSun: The pink is really spectacular! I've never seen pink before. The ones that grew in our parking lot were like Ellens, very pretty white with the yellow centers. I'm excited to see you guys having such great success with these beautiful flowers. They grow really well here and my backdoor neighbor has them planted all along his fence line, which of course means I get to enjoy them too! They must be six feet high and six feet wide? All different colors and they are just spectacular. I will get pictures the next time they are in full bloom, sorry I can't pass on the scent! I love this color. Its probably my favorite. I also like the white ones with the yellow in the center. I have a plumeria that should have pink flowers. Not sure what the other will have. I bet the aroma is to die for. I have my plumies outside my wondow. I really cant wait till they flower, that way I get to enjoy the scent of the flowers. What wouldn't grow in California? Thanks Sea_Sun88. I have not seen that colour even on the 'net. That was exhilarating just to look at the picture. Even the stalks were red. Never knew that before. You both are lucky to be living in such a beautiful climate. I know, that is such a nice color. I live in southern California and the weather is decent. The only time I hate it its when it gets to May Gray and June gloom. SeaSun - "I live in Southern California and the weather is decent..." You are just too funny! Go to Buffalo in January and then come home and complain about even one day of our weather. Our June gloom is "a gorgeous summer day" in Buffalo! I know you are young, but until you have been around a bit you have no idea how absolutely PERFECT San Diego weather is! Appreciate!!! Last edited by PhalPal; 06-16-2007 at 12:05 AM. Buffalo? Toronto is worse in winter,although it is only about 150km (100miles) away. . Summers are better here since we have less smog.